How much of your life savings would you use to decorate your room at a Motel 6? This question in a recent study prompted us to remember how short our life is on this earth and how transitory are the things that we tend to give importance to. We want to thank all of you who have chosen to invest in rescuing lives for eternity in Las Tablas. We are not in Las Tablas yet. We are still in the U.S.A….and have had the privilege to meet more brothers and sisters in Christ who are serving faithfully in their churches. We are encouraged to see their concern that their local body not stagnate by thinking only of its own interests, but that it gain fresh life by helping to birth other churches. We have been on the road every weekend but one. This weekend will be our last trip. We will be with the Alethia Church in Harrisonburg, VA where our daughter attends. In October we did presentations in NC at Gardner’s Baptist in Macon, Lake Gaston Baptist in Littleton, and Springs of Life Baptist Church in Durham, as well as Salem Baptist Church in Richmond, VA, and Common Ground Community Church in Portsmouth, VA. In Las Tablas, the week of October 17-24 witnessed the first event that our teammates the Muhas and Chamorros had planned together. A couple who are friends of the Chamorros came from Argentina for a week’s stay and spoke/preached several times. One lady received Christ at the ladies’ meeting! While not all was smooth sailing, they did learn more about how to function as a team! Thanks to all of you who joined us for our day of prayer on October 9th. We have peace that by the time that church budgets are approved in November and new families come on board we could be 100% supported. We are at 97% as of this date. We are happy to announce that TEAM already gave us clearance to leave for Spain. We plan to leave for Madrid the first week of December and stay up to 3 months if our visas have not been granted. If the visas are approved by then, we will return to D.C. to pick them up and then return to Spain for good. 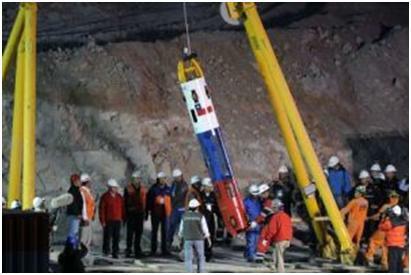 On October 13, after spending 69 days trapped a half mile down in the San Jose mine in Chile, 33 miners were rescued. What a testimony of a concerted effort by a nation to rescue those trapped miners. The two of us watched in amazement as they pulled out the first miner in the Phoenix-2 capsule. The world celebrated as each miner was lifted to surface. In watching this rescue we thought of our upcoming ministry in Las Tablas and saw many similarities. Las Tablas has a similar need of people who need to be rescued. It requires a powerful drill bit to penetrate hardened rock so deep, many resources, teamwork, and so much more. Together we can make a concerted effort to take the powerful gospel message. It alone has the ability to penetrate hard hearts. And the rejoicing in Heaven for every soul rescued will far surpass what we recently witnessed in Chile!